This thicker formulation of Color Magnet was made specifically for screen printing, and can also be used for stamping or stenciling. 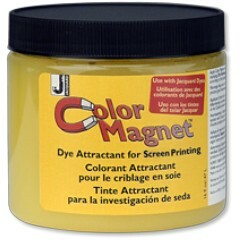 Simply apply Color Magnet directly from jar to fabric by screen printing, stamping or stenciling. Leave to dry thoroughly - you can speed up drying by using a hair dryer if you wish. Then dye according to dye package instructions. Color Magnet will attract more dye where it has been applied.